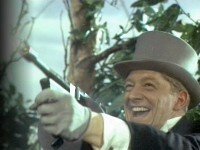 Emma finds a toy train running on the floor of her flat, and the train carries a placard with, "Mrs. Peel—We're Needed!" Awaiting the arrival of the Prime Minister, Steed and Emma discuss the titles they'll receive for having saved his life—quite prophetic, considering that Diana Rigg would in fact become a Dame! A train conductor with a serious grudge against the Prime Minister devises a creative assassination scheme involving carefully-timed trains. This ho-hum episode starts out on the right track but quickly loses steam owing to a paper-thin plot and dialog that carefully explains e-v-e-r-y-t-h-i-n-g, giving the impression of an introductory episode for viewers somehow not familiar with the spy genre. Certainly not Avengers enough to sustain the hour for this fan. But classically eccentric John Laurie does provide a reason to stick with it. Also, writer Roger Marshall has penned an essay about his tenure on The Avengers. 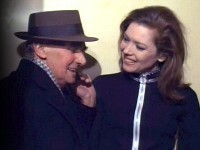 At odds with the direction Brian Clemens was taking the series, scriptwriter Roger Marshall left. Clemens rewrote one of his scripts, and used the pseudonym Brian Sheriff (the Sheriff doing the Marshall's job... get it?). A scene where the prime minister's coach is inspected opens with a shot of the coach on a siding with a uniformed policeman walking around in front of it. This breaking of the no-policemen rule seemed almost gratuitous, since it was so unnecessary. Thanks to David Schwartz for flagging this one. Ilsa Blair (the Bride) was the second wife of frequent Avengers guester Julian Glover. Does the Admiral's office look familiar? Gregory McVey-Russel suggests notes it is also Willows' home in "What the Butler Saw." Mark H. Stevens asks: "Recognize the newspaper Emma was reading right before her fight with the bride? Sir Andrew was reading the exact same paper in "Death's Door." Well, that's why they call it trivia, no? Acronym Alert: MAUD is Microfilm And Unencyphered Document. Steed's Aunties: An unofficial entry. Lucas left behind a photo of his "Aunt Maude" and Steed indicates that this is standard operating procedure. Made it sound as if every agent had an "Aunt Maude." And, if it's not obvious, the title is a play on the venerable stage play and film, "A Funny Thing Happened on the Way to the Forum." 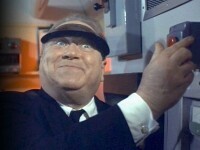 Later, Steed finishes the grinning mastermind's explanation of the bomb plot with, "Pop goes the diesel." Oh, how perfectly droll.